As we head into a new year, we read so many amazing articles/blogs about how to set goals, not set goals, focus on dreams, what to focus on, making resolutions and so much more. I love New Years. We get a fresh start -a new beginning. Yet, this year, I’ve had a hard time setting goals. Yes, there are a few amazing opportunities coming up in 2014, such as co-leading a youth mission trip to Guatemala! (I’m so incredibly excited about that. :). Yet, I feel like there is something inside of me that is saying there is so much more to come. More life change. More dreams. But what is it and how do I discover it?? A friend of mine recommended a devotional on YouVersion called “One Word That Will Change Your Life“. I was intrigued. The premise of the devotional is that focusing on just ONE WORD for the entire year, will help you discover what God has for planned for you. By getting rid of clutter and complexity, which often leads to procrastination and paralysis, and focusing on simplicity, success and clarity will no doubt result. Sounds simple enough, doesn’t it? Pick just ONE WORD for the year. But how?? On Day 3 of the devotional, it explains the practical side of finding your ONE WORD. Step 1 – Prepare Your Heart (Look in) – Let God examine your heart, and He will give you clarity. Step 2 – Discover Your Word (Look Up) – Ask God “What do you want to do in me and through me this year?” Don’t pick a good word, receive a God-word. Step 3 – Live Your Word (Look Out) – Live out the word that is meant for you, as it will have impact in all areas of your life (physical, mental, spiritual, emotional, relational, and even financial). The word that kept popping into my mind was “discipline”. But what does that mean? In what area do I need to be more disciplined? A friend suggested that maybe my word should be “stillness”. Ahh!! That just sparked something inside me. I’m a “yes” person. Yep, I’ll admit it. It’s extremely hard for me to say no to opportunities that I believe are of importance. I love to be involved in community, ministry, leadership, events and pretty well anything that helps people. Plus, I’m an extrovert. I’m not very good at being alone. Generally, I get my energy from being with people. However, occasionally, when I haven’t had any time alone, I crave stillness. When I do have time alone, I usually get restless. I guess that’s why I love social media so much…I never really need to be “alone”. I do know it’s good to be alone. Just me and God. Being still is a discipline that I have to develop. I love the simple verse Psalm 46:10 Be still, and know that I am God. So is “stillness” my ONE WORD for 2014? Yes, I think it is. I need to practice being still, in order for me to continue to do everything I love to do, and to be of any use to my family, community, church and work. Truthfully, it does scare me a bit to think of being still and to focus on that for a whole year. But, to ensure that I’m healthy and strong mentally, spiritually, emotionally and physically to continue to be available to people, I will commit to developing the discipline of “stillness” in 2014. 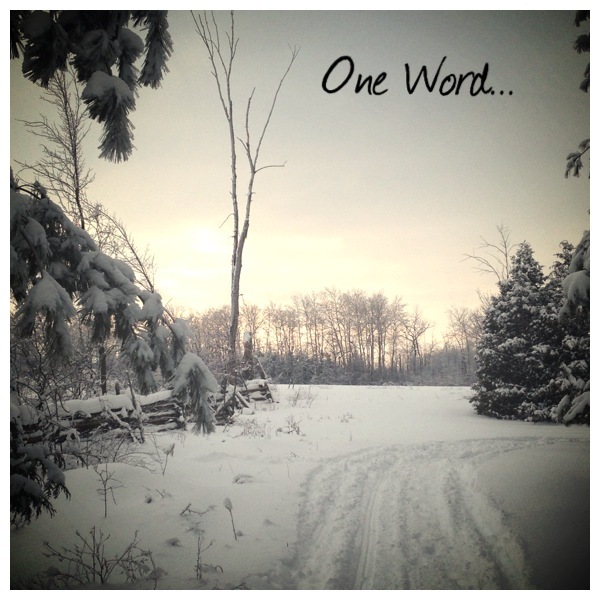 What’s your ONE WORD for 2014? To help you discover what it is, the devotional is only 4 days long, and I highly recommend it. No, dear brothers and sister, I have not achieved it, but I focus on this one thing; Forgetting the past and looking forward to what lies ahead. how is your word working for you so far? I’m doing ok…so far. I try to keep part of my early morning quiet time reserved for stillness. But it is so easy to get distracted. But I’m working on it! Love your words for 2014!! Thanksgiving, Grace, Joy. Awesome!